Published on January 18, 2018 in general info. Closed Tags: Cape Cod Luxury condo sales, Cape cod real estate sales, Cape Cod sales, Provincetown, Provincetown luxury homes, Provincetown new construction, Provincetown real estate. 184 Commercial Street is a mixed use building with 4,252 square feet. It consists of a large street level retail space and a total of four bedrooms and six bathrooms on the second and third floors. It is directly across from Bubbula’s in the near West End. It is being marketed for $1.549M. 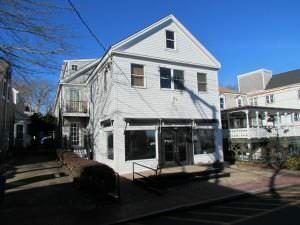 MLS REMARKS: Mixed use commercial and residential building ideally located in a high traffic high visibility location in the center of Provincetown. 1st floor has one 1780 SF retail space with office and lavatories. Top shelf remodel of this space was done in 2010. 2nd and 3rd floors have 2500 SF of residential space with 3 kitchen and 4 bedrooms. There are adjoining doors and stairs so the spaces can be configured as one pleases. Nice waterviews, multiple decks. Extensive renovations have been done over the years but it needs a little more to put it over the top. Septic has passed inspection. Partial basement for storage. The building is not in a designated FEMA flood zone. See all properties for sale at Beachfront-Realty.com.